As the Borders top flight teams approach the business end of their season in National League One life is a bit more chilled. With most teams having nine games remaining things are not quite at the critical stage yet although Kelso and Peebles still have a lot of work to do if they are to escape from the bottom two places. Having won seven of their last eight games however Jed-Forest have suddenly found themselves in fourth place with a real chance of reaching a promotion play-off opportunity or even the top spot itself. Just seven points separate second, third and fourth places with Watsonians sitting pretty on top with 58 points, 10 points clear of second place Marr. Jed coach Jammy McFarlane doesn’t want to look to far ahead however as his charges prepare for their last league game before the Christmas break. “We’re not getting too carried away,” he said. 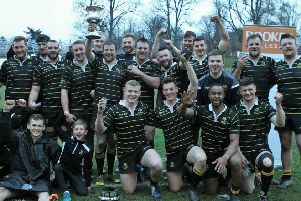 Jed face Edinburgh Accies at home on Saturday while Kelso and Peebles travel to play Marr and Dundee HSFP respectively.